This delicious sandwich brings you the taste of summer! It also gives you a fair amount of vegetables and makes a nice and filling lunch without leaving you with a heavy feeling in the body..
At the moment, I seriously long for spring and summer. As you may know by now, I’m not a winter person. And the winter in Denmark just seems endless. The days on end with heavy grey clouds where it seems like the sun never rises affect my mood, my energy and my will to live. Okay, maybe not that dramatic but I’m definitely a better version of myself in all months other than December, January and February. These days I enjoy a few rare sunny (though still really cold) days and I love that the days have already become longer. Since my work life is fairly flexible I try to get outside every day in order to get some daylight. And while I do enjoy my daily walks, I also look forward to the days when I can sit outside on my terrace and drink my coffee while feeling the sun warm my face. And walk bare foot, though that will have to wait for another few months. After I made the Low Carb Lasagna loaded with vegetables the other day, I had some grilled eggplant left over. 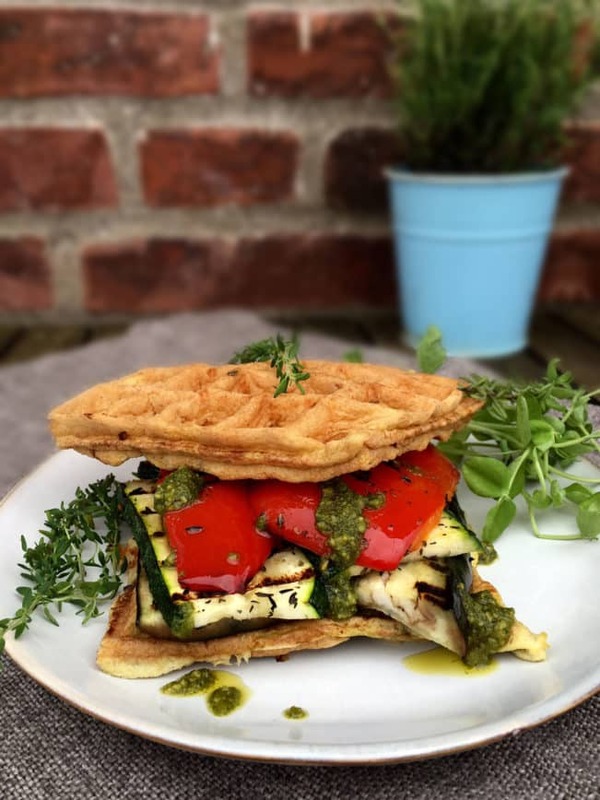 I grilled some zucchini and red bell pepper and put them all in between two onion waffles with some pesto and suddenly I had a sandwich with the taste of summer. I almost can’t wait for the days where we’ll just throw some meat and veg on the grill and call it a meal. 2. Brush vegetables with olive oil, drizzle with salt, pepper and thyme and grill them on the grill or on a grill pan – or cook them in the oven or on an ordinary frying pan. 3. 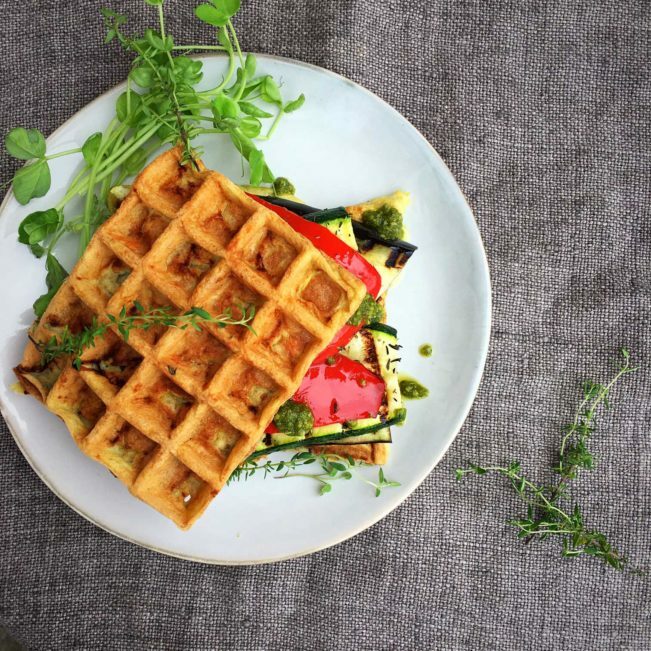 Make your sandwich by placing the grilled vegetables on one onion waffles, drizzle some pesto over and close the sandwich with the other onion waffle.